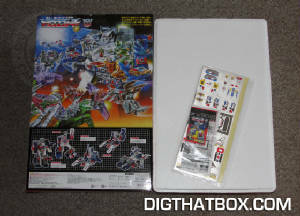 Pics 1-2: Let's start with the packaging. In short, it is immense. 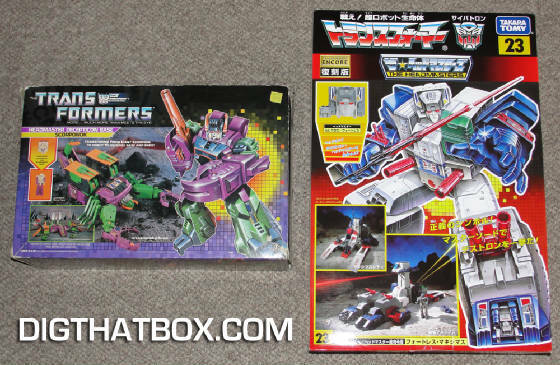 Larger than any of the other city-bots' boxes, it is almost the size of 2 bankers boxes placed side by side. Pics 3-4: Inside, you get styrofoam packaging! Lift off the lid and you'll see the big guy sleeping inside. 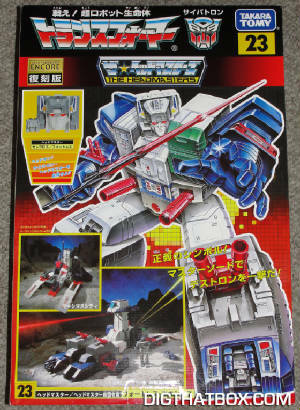 He comes with all his accessories, including the Japanese exclusive swords for Cerebros and Fort Max himself! Pic 5: Out of the box, he's massive! At almost 2 feet tall, he definitely commands your attention. Pics 6-9: With weapons and companions deployed, he becomes even more imposing. 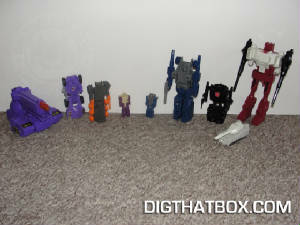 Pics 10-11: Remove Fortress Maximus' head, and after a couple twists and turns you have Cerebros. 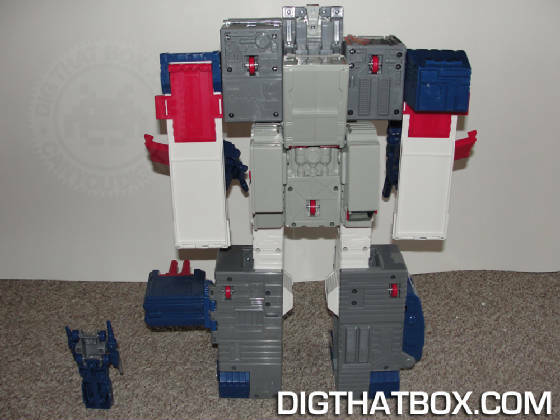 Like all standard headmasters, the chest flips open to reveal Fortress Maximus' Tech Specs. 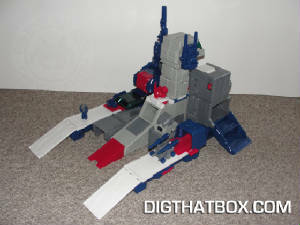 Pics 12-13: We all know Fort Max is (until the pending release of Generations Metroplex) the largest Transformer ever made. 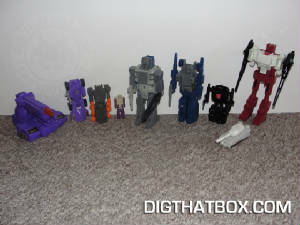 Still, I had no idea how large he was until I placed him next to the other G1 City-bots. 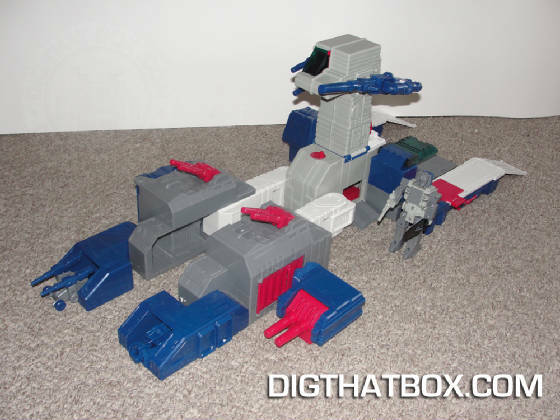 Pics 14-15: Speaking of city, in his City mode, Fort max is any kid's dream, Trans-fan or not! With ramps, stairs, an elevator and even a tower, he's loaded with play value. 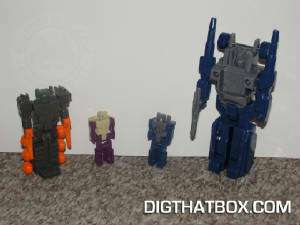 He works well with Minibots, Headmasters and even Matchbox/Hot Wheels cars. 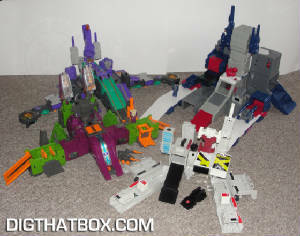 Pics 16-18: Comparing him to Scorponok, Trypticon and Metroplex (old...not Generations Metroplex), Fort Max is a monster. That's all there is to it... he's overwhelming in size and play value. 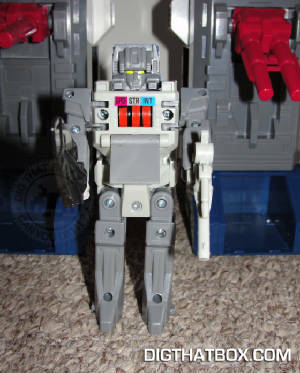 Sure, he's got a chunky "Fisher Price" aesthetic, especially compared to the detail on the original city-bots, but for sheer play value he wins. Pic 19: Okay, his "Battle" mode is really just him on his back pretending to be superman. 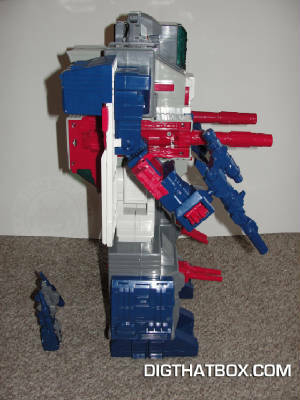 Still, with all the armaments and a tower for Spike to observe from, he does offer a lot of play value. Personally, this is not my favorite mode, but it’s impressive notwithstanding. 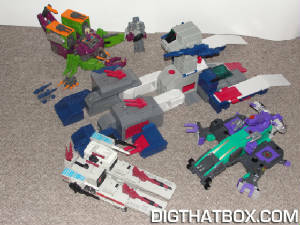 Pics 20-21: As you can see, all of the Battle modes were essentially afterthoughts, with notable exception of Scorponok. 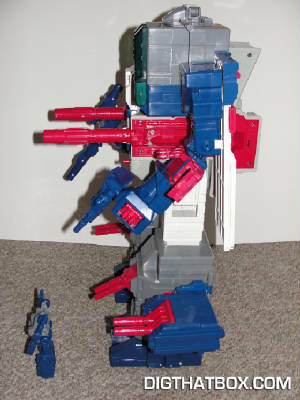 Fort Max certainly takes the cake when it comes to being imposing. 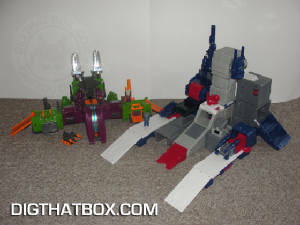 However, this round goes to Scorponok and Metroplex for mobility and sheer play value. In this case, bigger was not better. Pics 22-25: Let’s not forget all the wonderful accessories. Fort Max's pals Cerebros and Cog tower over Scorpokok's minions, but Cog is partsformer with little play value even when disassembled into Gasket and Grommet. 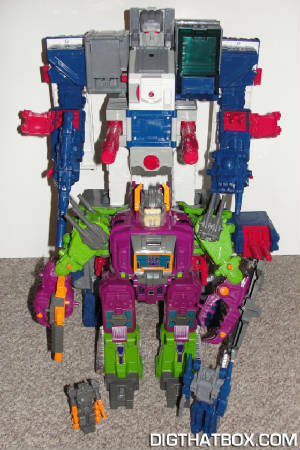 Spike is your standard headmaster, with the weak arm-hinges and all. 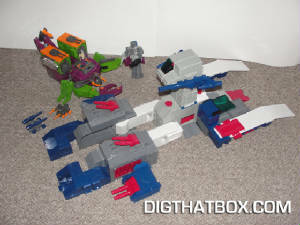 Still, it is VERY cool owning a G1 Spike toy! 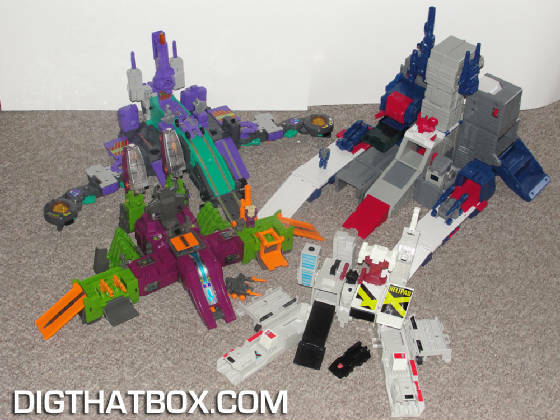 Altogether, Metroplex and Trypticon offer better accessories, but the Cerebros-Spike Headmaster in a Headmaster gimmick is cool, if a bit of a mindbender. 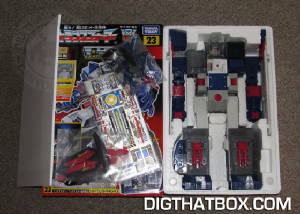 I OWN A FORTRESS MAXIMUS!!! 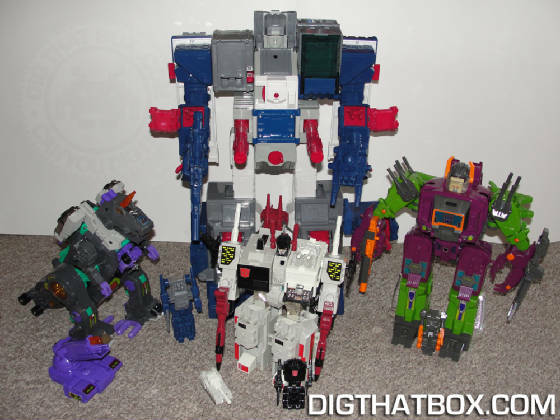 I OWN A FORTRESS MAXIMUS!!! 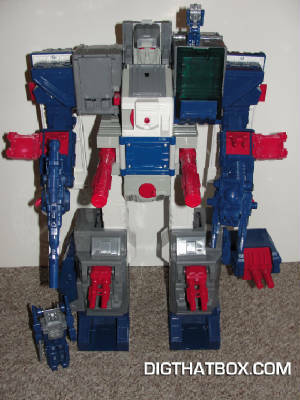 I OWN A FORTRESS MAXIMUS!!! 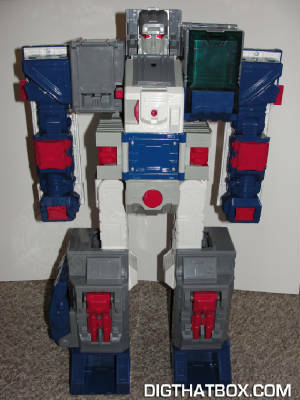 I OWN A FORTRESS MAXIMUS!!! Sorry...I NEVER thought I'd be able to say that! That alone was worth the price of admission to me ($350 delivered to my front door). 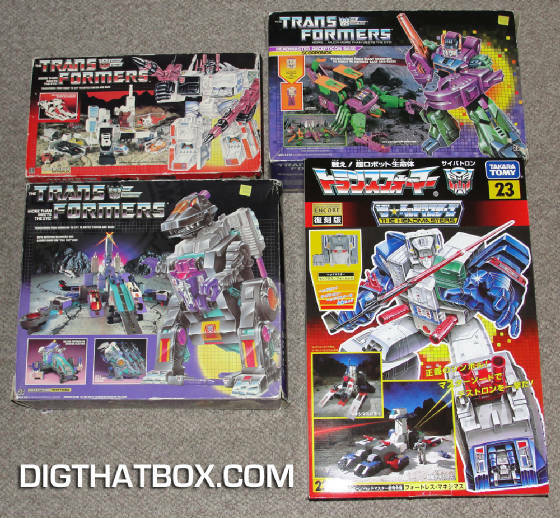 EBay sellers were selling anywhere from $1000 for boxed junk to $4000 for mint one. 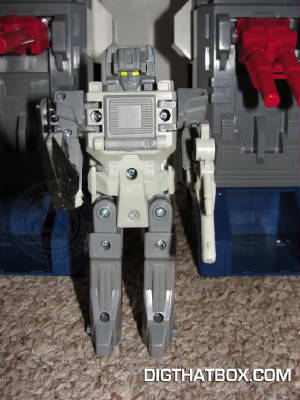 I'll consider $350 for an absolutely mint piece to be a bargain, especially because it includes EVERYTHING (even the Japanese swords, which I just find silly for a robot that can step on his enemies, or blast them from miles away). Do I recommend him? The G1 fanboy says ABSOLUTELY!!! 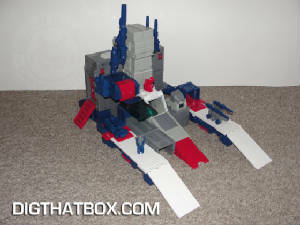 Who needs college tuition, rent or food...this is FORTRESS FREAKING MAXIMUS!! The grown up in me is thinking this was a waste of money, spent on a giant hunk of plastic that'll just collect dust. He's the ultimate brick, made up of figures that are smaller bricks. Besides, who has the room to display this monster. Then again, who cares what my adult self thinks. This time, let good sense take a back seat to immature toy lust. 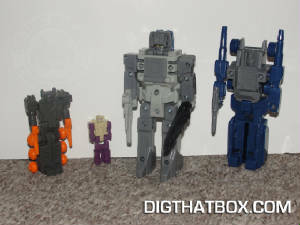 TAKARA...TAKE MY MONEY!!! !